Paw pads that have been damaged by asphalt and dryness are wrapped with steamed towels and massaged with Pet Esthé Paw Pad Moisturizing Gel. as a finish, you can choose Pet Esthé Paw pad Anti-Slip Lotion to prevent your pet from slipping. Enjoy having your pet's nails colored. You can choose your favorite of 10 colors. Natural plant ingredients gently protect your pet's nails. They are for pets, so they are safe for licking. Composed of natural plant aromatic ingredients and Dead Sea salt. They make the coat moist and clean. The relaxed half-submerged bath, and the aroma that rises into the air heals your dog. Choose your favorite among 6 aroma scents. Give your pet a superb massage with aromatherapy massage gel containing complex amino acids, and aromatic oil. Choose your favorite blelnd of fragrances and oils from 6 effects: relaxation, tranquility, relief of fatigue, reduction of skin trouble, refreshment, soothing of respiratory system. They also make the coat lustrous. In the thalassotherapy system, mud containing sea mud and seaweed extract ingredients removes waste from deep inside the pores which cannot be washed away with ordinary shampoo. It also supplies mineral ingredients. The coat of long-haired dogs becomes comfortably smooth and fluffy, and the coat of short-haired dogs becomes moist and lustrous. You will certainly be satisfied with the finish. 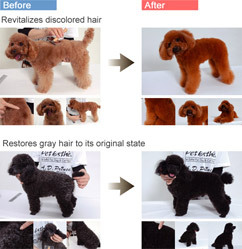 The purpose of this rejuvenation system for pets is to draw out as much as possible your pet's nature, and to maintain its youthfulness by restoring the original coloring of coats which have faded due to such things as aging and ultraviolet rays. *Please consult us about partial dyeing. In order to enhance the effect of all treatments, we use the apecially formulated Pet Esthé Spa Shampoo and Conditioner.